I went to the PC Show today with my mummy, uncle peter and aunt jeannie because she was looking for a laptop. 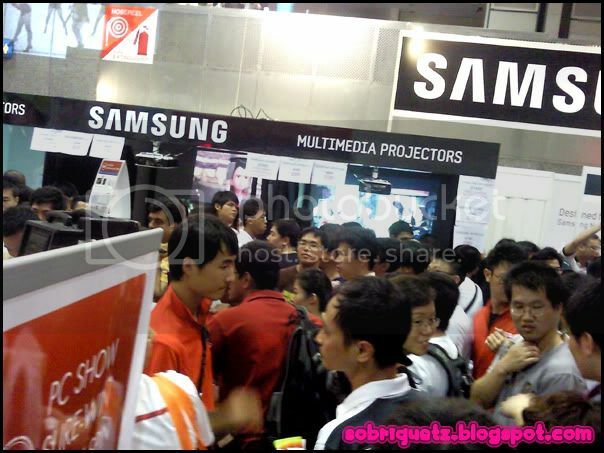 We expected the PC show to be super crowded, but it is honestly not that bad! I have experienced worse at such exhibitions. In fact, the 6th floor didn't have much of a crowd to speak of. Why? Because it was hosting the NETS Redemption corner at the booth too. 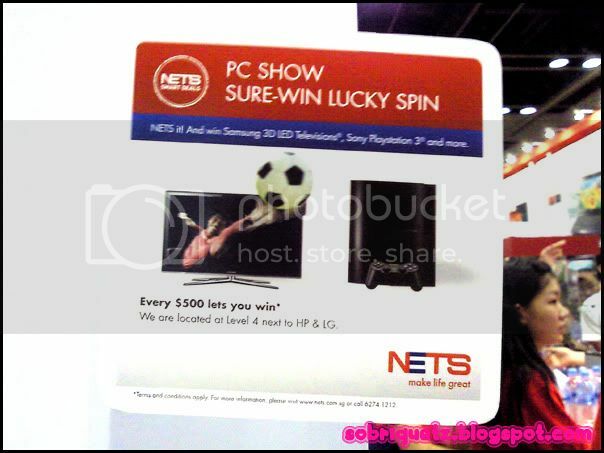 Every $500 you spend, you are entitled to a sure win lucky draw. So of course many people went for it. Look at the crazy amount of people squeezing and shoving! so basically, you have to take a queue number from this guy in red. However, it was so crowded that we didn't notice, so we just asked some stranger whether we needed to queue and he kindly told us that we need to take a ticket number and to wait for the announcement. So we took the queue number ans was appalled that we have to wait for around 80 more numbers to be called! There wasn't much space to stand too and everyone was squeezing at one corner as there were other passerbys. The booth was really really small as well. There was some form of crowd control: one girl announcing on the microphone for everyone to move to the right. Well, it wasn't really an empty space to stand, we had to pave the way for other strangers as well. 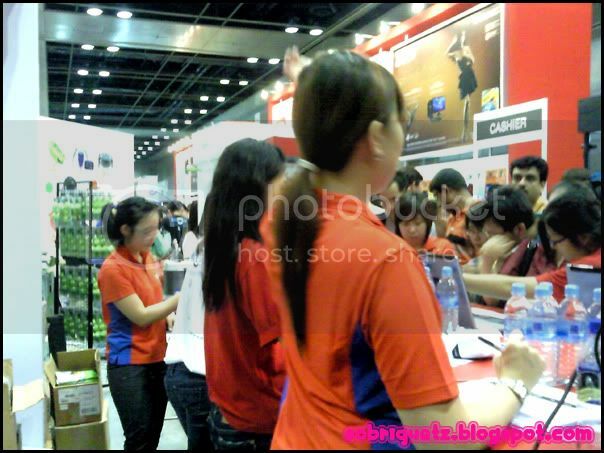 And one of the worse things was that we were beside the Citibank booth too (also hosted by McCoy i think) so this Citi salesman will come and talk about his card and persuade us to join. Erm, go away pls. Even though I intend to get a Citi Clear Card soon. After waiting for some time, mummy went forward to find out what was taking so long. Apparently each person has to show their ic, and this girl will copy it down while another girl teaches you how to press the spacebar to spin the Nets wheel. I think they have already tried the best of their abilities to speed things up, but they were lacking the counters. Nets should have held the redemption outside the exhibition hall and have like 10 counters. Not enough laptops? Never mind, just revert back to the pick-a-ball system and everyone will still be happy. As long as they do not have to wait that long. 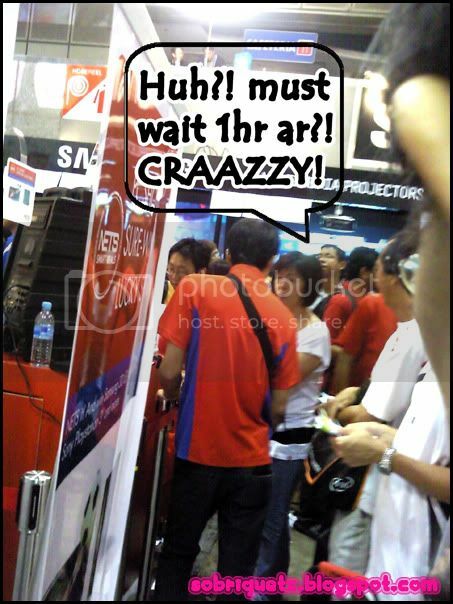 Even though Singaporeans appear to be willing to queue for anything (ie. good food, good sale, etc), but don't take that willingness for granted. Not everyone would like to wait in such a squeezy environment. Of course it is okay if people still want to browse around the PC Show. 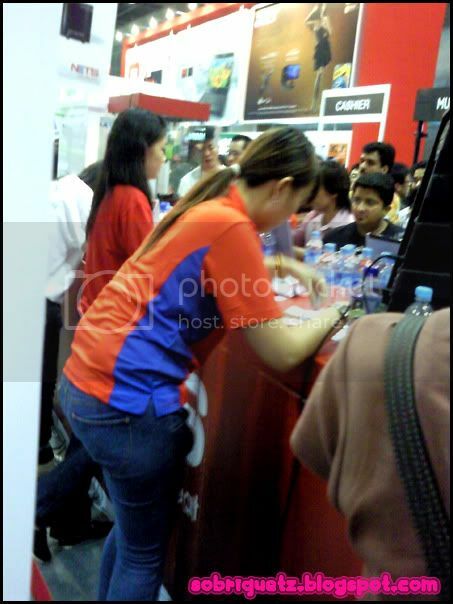 They can take a queue number, browse, and then head back to the booth. Should their number be skipped, they will be re-inserted in anyway. But I think usually, people tend to do all their shopping, and then go to such redemption booths. At least that was what we did. So we just stoned, and waited for our number to be called. meticulously copying down the IC particulars. perhaps they will have to key into their database and then send mailers? "You have won $1 nets top up"
freaking win already lor. I queue up 45mins, and I earn $1 to be inserted into my cashcard lor. It was done instantly. Beside me, this couple won.... $3 nets top up. for the next pc show, please change back to the picking-ball system and have 10 counters administering it, thanks.